Chirashi are mini-posters/ flyers used to advertise movies in Japan. Due to the fact they are only available from movie theatres while the movie is showing, they are collectible movie memorabilia and rise in value based on age and scarcity. Movie flyers are often printed on high quality paper, and are usually a single sheet (2 sides) or 2-page "gatefold" (4 sides). Of course if you are a fan of Japanese movies, then you've come to the right place! At present most of our posters are the "B5" size (7"x10"/18cmx26cm) of movie posters - also referred to as Movie Flyers or "Chirashi". Due to their handy size and low cost, they are by far the most popular size of poster amongst Japanese collectors. Unlike larger movie posters, you can collect a wide selection and store them easily in an A4 or B5 sized folder, or display a selection on your wall (without requiring a huge wall to fit them!). The vast majority of B5 Chirashi can be bought for under $10.00, and we have over 3000 titles priced at $2.50 or less! While older and very rare sought after titles can occasionally command prices into the thousands, this is very much the exception. Along with the B5 size, Japan also produces posters in the larger B0 to B4 formats. 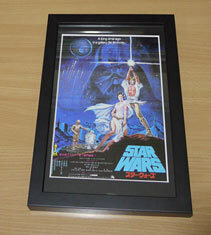 For hobbyists and those collecting posters for fun, the B5 format is a rewarding way to collect movie memorabilia. Those collecting movie posters as an investment generally prefer the larger formats which are much more expensive, but have the possibility of rising further in value. Perhaps the best aspect of collecting Japanese chirashi is the huge range of titles available - not just of Japanese movies (of course), but also films from Hollywood and around the world. Even rare genre titles that are extremely difficult to find anywhere else. What's more, it's possible to pickup highly sought after classic posters at just a fraction of the price of a U.S version. We have over 7000 titles available, perhaps the best selection on the planet ... and we're constantly adding more. If you want to display your posters framed on the wall, suitable frames are generally available at a fraction of the cost of framing a large poster. What's more, its possible to display a nice selection of your favourite movies on your wall - even if you have limited wall-space! Release Year This is the release date of the poster. Note: This can be different to the original release date of the movie (which is shown in brackets after the movie title). As a poster's age affects the price, we show the age in brackets after the poster release date. This is why two quite similar posters for the same movie can have different prices. Gatefold A double-size poster folded in half to create two "pages" - both of B5 size. usually this is used to provide additional information about the movie on the two interior sides, but sometimes can be used to promote two separate movies, with one on the front page and one on the back. 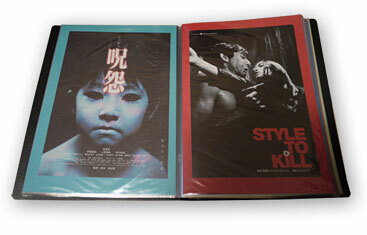 Occasionally deluxe versions are produced such as Tri-fold (3xB5), Quad-fold (4xB5) or more. Some fold out to create larger-size posters. UV Overlay A glossy section has been printed on an otherwise matte poster to create a unique look. Die-cut Where an area of the poster has been cut out to produce a custom-shaped poster. Metallic Ink Reflective metallic ink has been used on the poster to create a premium quality poster that shines in the light. This reflective quality generally cannot be shown in our images. Mylar print These are created by printing the poster design on top of a thin sheet of plastic called mylar which has been covered in either silver or gold metallic paint. The result is a unique 3D or mirrored effect. Compression lines Where light diagonal indentations have been made in the poster during the printing process. These are not creases, and are mostly unnoticeable when the poster is laid flat. They are regarded as a minor flaw, and are not seen in posters from the past 30 years.